Around holidays and travel I’ve been loading my i-devices with a number of games to explore, and have noticed a growing number of games where the story is not only the main focus, but is delivered in increasingly inventive ways. 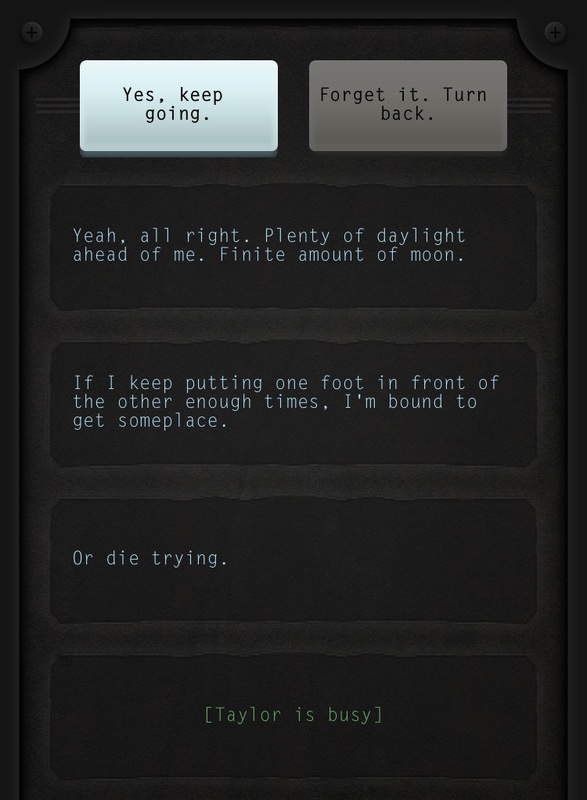 One of the simplest examples is Lifeline (iOS and Android, best on mobile) which is a text-only adventure based on a familiar outer space/alien invasion theme: however, a clever use of real time narrative delivery produces a strong sense of realism and urgency. You might help Taylor (the protagonist) decide where to travel, but he’ll then tell you it might take a few hours – and that’s it for a few hours: you won’t hear from him again until he’s arrived (or something happens en route). It’s a simple trick, but one which immediately gives you agency: you’re very much in step with the character – he waits until you have time to help, and you wait until he needs it again: you might go to bed having found Taylor a safe place to sleep, then wake up to find out whether he has survived the night. The story is, in itself, interesting too – with a number of branching paths and alternate endings. 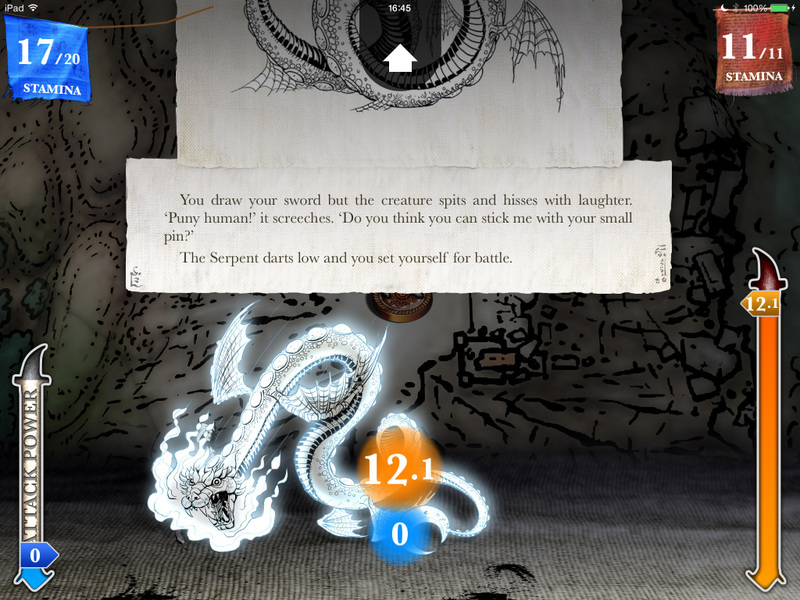 More complex examples come from Inkle, who have been faithfully and cleverly transposing Jackson and Livingstone’s original Fighting Fantasy (‘choose your own adventure’) book Sorcery into a four-part iOS/Android game. The original text has been chopped into short sections, that sometimes provide a straight ‘choose path A, B or C’ as in the original books, but sometimes merge with other game mechanics, such as motion-based fighting, or the rolling of dice in a gambling game. The narrative unfolds on a beautiful map, and the latest chapter (Sorcery 3) includes visual/narrative layers which change based on the time zone you’re currently in. It’s a clever, compelling mix which is just as thrilling as more graphically complex adventure games. Inkle’s most recent game is 80 Days (iOS/Android) – that, you’ve guessed it, is based around the Jules Verne classic text. Again, here they’ve taken the original text from the book (though in this case, embellished it with their own creative additions) in order to set up an exciting race around the world. The transfer to a game means that many more routes and forms of transport are available than Phileas Fogg and Passepartout had available in the book: meaning that replaying is as exciting as the first play through. But what struck me most was the depth of branching storytelling: on each mini journey – say in an airship between Acapulco and the Caribbean – various narrative paths open up around the passengers on board with you, which can seriously affect your onward journey both positively and negatively. As with Sorcery, the surrounding graphics and game mechanics are beautifully executed, but its the way the strong narrative has been embedded completely with the gameplay that elevates the experience. These are just a few examples of the growing number of games looking to use narrative in more creative ways, and in combination with other interesting game mechanics. The value of such an approach in a learning context is obvious in areas where narrative is studied (English language and literature): but such an approach might work well in other disciplines where learners need to engage closely with any text – how about turning legal cases into branching narratives to explore the real world implications of different decisions; or adding battle mechanics into a study of Anglo-Saxon saga poems?